1980: true to its philosophy of remaining on the cutting edge of the watch industry, the Corum brand created the Golden Bridge model, a watch equipped with an entirely unprecedented and remarkable “baguette” movement. 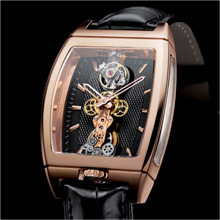 2011: the Golden Bridge, which has just celebrated its 30th anniversary, has become one of the brand pillars and an icon in the Swiss watch industry. In order to treat its iconic model to an innovative touch, Corum chose to work on the baguette movement with its tourbillon escapement. Any changes to its aesthetic necessarily implied first accomplishing a genuine technical feat. Part of the bridge of the CO213 movement – normally entirely made of 18K solid gold – has been replaced on the level of the tourbillon carriage by a transparent sapphire component. One of the major difficulties involved in this operation lay in the necessity of ensuring the smooth coexistence of two materials with such different degrees of hardness, rigidity and dilatation coefficient: sapphire and gold. The tensions in play are even stronger because this is a baguette-type movement, and the difficulty that had to be surmounted is all the greater because the sapphire bridge is a mere 0.6 mm thick. One of the ends of the sapphire plate has been screwed to the gold bridge in the usual way, while the other has been cut to form a sharp tip and is simply nested in the second part of the gold bridge, which is specially machined to form a V shape. Within this new configuration, the tourbillon carriage of the latest Golden Bridge model is now held by a transparent crystal part that is perfectly visible and more airily light than ever. It thus affords a view of its upper bridge shaped like the Corum key emblem, along with all the mobile parts of its silicon escapement. The entirely guilloché solid gold dial is placed behind the movement rather than in front as is generally the case. 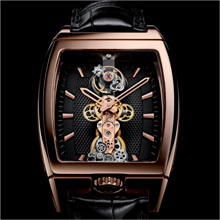 It is openworked to ensure that Caliber CO213 is also visible through the back of the watch. The case of this Golden Bridge Tourbillon model is a study in transparency enabling one to admire the ethereal movement from either side of the case. No less than four sapphire crystals are thus required to build a case that is watertight to 30 meters and looks very much like a display showcase housing a precious object. Such an exceptional model is naturally issued in an extremely limited production run: only 10 in white gold and 15 in 18K red gold will be offered to collectors and devotees of this exceptional collection.